I have trained both types of horses that you mentioned. I love to work with horses that I call ‘next day learners’ or horses that the next day come out and have really absorbed the lesson that was taught the day before. They may not be experts but they seem to have thought about what went on and they are applying the concepts at least. Some horses, however, don’t come out the next day retaining the information. Some reasons for this can be; the lesson moved fast and the horse didn’t keep up, the lesson was unclear, the horse is a slow thinker, etc. It sounds like you have trained a number of horses so we will pretend that the lesson was appropriate and that the horse seemed to absorb normally that day…which leaves us with the idea that the horse is a slow thinker. These horses often require repeated lessons in the same subject. Yes, some days and weeks even it seems like you have been teaching the same thing over and over with little progress. The bad news is that the process is slow…the good news is that once these horses ‘get it’ they tend to hold onto it AND they tend to be solid. Generally slow thinkers don’t try to out think you. Most horses thrive on consistency such as being worked 5-6 days a week. I especially find this to be true with the ‘foundation’ training. It is common to have some loss of retention after a long break especially earlier in the training. As I get to know the horse I start to establish that individuals learning curve. I can remember training a handful of horses, like you described, where I actually chose during the first month to get them out everyday; it just wasn’t worth the regression of giving them time off. The work didn’t have to be hard, just consistent. Once they reached a certain level, for example being solid at the walk/trot/lope and beginning of the spin, they seemed to level out some. They didn’t necessarily learn faster but they didn’t seem to back slide as much. Interestingly, some of these horses have gone on to be very solid citizens later in life. As they don’t think quick they tend to almost never ‘cheat’ in the show pen or on the trail. It makes me wonder how many of these horses are discarded early in training because of their slow thinking which at times can almost come across as a learning disability. ← A Horse's View: Alfalfa cubes or manure? Do they make saddles that fit draft horses? I want to ride one. It seems so fun. I prefer the slow thinker……… but I am a patient rider, but I tend to speak/move/rapidly when I have a thought in my head……….especially in the reining pen I would rather have the horse wait on me than decide it needs to do something…….. These type of horses are easier to me to ride……. I think they make a better bridleless horse as well. But they are hard to come across……… as sometimes it is more laziness than a slow thinker. I am blessed to have one at the moment that is helping me succeed in a variety of disciplines. And I thank the lord that I finally realized he was suffering from ulcers from his previous owners/trainers not realizing and appreciating his slow thinking. Long story shorter, I think he developed the ulcers from being reprimanded for things that he hadn’t even realized he had done yet. Fortunately he is in his forever home and he can express himself now and I will deal with it…. That was good Stacy, thanks 🙂 I’ve had both also, and the ‘slow’ ones can truly be s.l.o.w and frustrating, but you just keep plugging away and then when it seems nothing will ever change, you go out one day and theres an “Ah-Ha!” moment. Thats when I rejoice! I love the ones that are stuck one day, but the next day work their tails off doing and thinking, like they stayed up all night going over it, but not all are those! I have a mare now (this ones mine) who I started as a 2 yr old and she was so “perfect” that summer I was elated! I put her out for the winter, pulled her up the next spring, did ground work and started riding her again, and she was a totally different horse: nervous, jumpy, unsure of herself. I plugged away at her all summer with no real improvement, had her teeth floated by a professional, and kept plugging. Her 3 yr old year didn’t get much better, but I found she Loves to trailride, so took her out when I could. Her issues are mostly in the arena, but thats where I start riding her before going out to ride since I can’t trust the first few minutes with her She doesn’t buck or run, but has anxiety attacks you can FEEL. She turned 4 in April and she’s the one in 100 that is driving me nuts. I do everything I can to make her confidence level good, am consistant with her lessons and seriously have not done anything different than I’ve ever done in starting horses for clients. But she is a nut the first 10 minutes of riding! 1st I get on in the arena and ask her to walk out and her head goes up, she hesitates, her eyes get big and its as if she’s never been asked to walk with a rider! Then I bump, cluck until she finally goes, ask her to lower her head back down and start some circles at the walk and she nearly jumps out of her skin! This is EVERY TIME I ask for a turn, EVERY TIME I RIDE HER! Its like she’s never seen my hand or the reins before and OMG she’s so terrified! She’s not a spooky horse either! I desensitize her to things, the reins over and over, she’s fine, it just suddenly scares the dickens out of her to turn! We go through this for 10-15 minutes for EVERY SINGLE ride! I’ve been working with her for 3 summers now! I’ve worked some pretty messed up, mixed up horses before to where they are gems, but my own horse is frustrating me so much, it makes me cry at times when I think about it. Shes Shining Spark/Nu Chex to Cash bred, with other champs on her papers also, and she was to be my ‘dream’ mount.People are telling me to ditch her or send her off– but Stacy, I AM a trainer also and it hurts me that I’m not making headway with this mare! She’s sensible in all other matters– I rode her last weekend away from home for the first time with a Huge group on a 4 hr ride, and she was amazing! If she has more than 2 days off, I have to be ready for that crazy ride the first while I’m on her again. If I ride her every single day (near impossible) she retains some of her sanity. I love her, she’s a sweet and intelligent horse with amazing good looks, but it has turned into a ‘love/hate’ relationship!! lol– I’m thinking the Lord gave her to me to keep me humble. I have gone through similar issues with my own horses versus others’ horses. I am not a professional trainer, but have done some training and worked horses for other people. In fact, my very best friend and I were just discussing this matter a few days ago. It seems like if the horse belongs to someone else we are able to work through the steps and keep a cool head through the entire process, even when they throw us curve balls, and able to keep emotion out of the training. 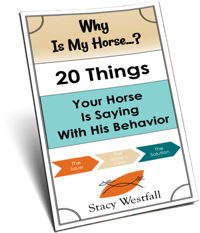 But when it comes to our own horses, it seems there is some unconscious emotional reaction that gets in the way when things don’t go right, and then the horse feeds off of it. It took both of us a long time (we have been friends and riding together for 13 years now) to figure this out. This may or may not be the case for you, but it might be something to think about. I just figured out last night, by talking to a new horsey friend, that I get nervous with my mare that Stacy blogged about previously because I have seen her flip herself over backward when she panics and many years ago I had a very serious accident when a horse flipped over backward. I never realized I was nervous when I worked her, but that lady saw it in a video that I took of a session with that mare. Point of the story, often times we give off certain kinds of energy without being aware of it. Maybe after her being like this for so long you are expecting it and giving her a vibe that is making her do it…. I also have found that I seem to hold a higher expectation level with my own horses than when I work someone else’s horse. Again, it took me many years to figure this out. Maybe because she was supposed to be your ‘dream mount’ you are holding too high of expectations for her, particularly after her first summer of being so great. I do that with my old boy, I figure he knew it before, or at home (versus somewhere that is not home), or whatever and he should know it here and now also, but I forget to factor in other stressors that may alter how he handles what I am asking of him. And believe me I have been in tears more times than I can count because of that horse and being so frustrated with him. In fact a couple years ago, when he was about 13 or 14 (you’d expect they can handle some things by that age), I took him to a trail challenge clinic. He was so awful I sat in the trailer and cried most of the day. I could not get his brain any closer to us than about a mile out. 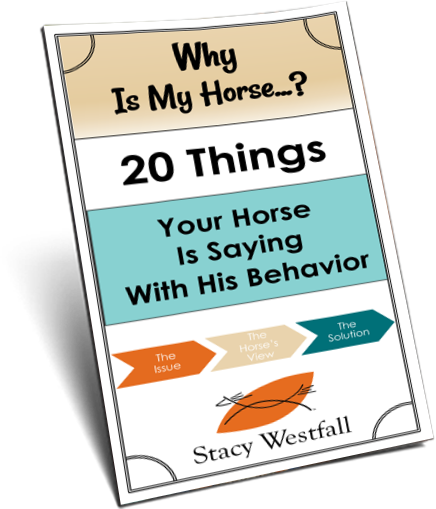 He wouldn’t lunge, he was spooking at every little thing (even a bale of hay in the arena), he was running over people and other horses, I had absolutely no control. And this was a horse that I showed in 4-H from the time he was a 2 year old, then he became my trail horse deluxe. Looking back I think it started with a bad loading in the trailer when we were getting ready to head out. I should have known his mind was off after that and just stayed home. Also another thing that may contribute is a hormonal factor. 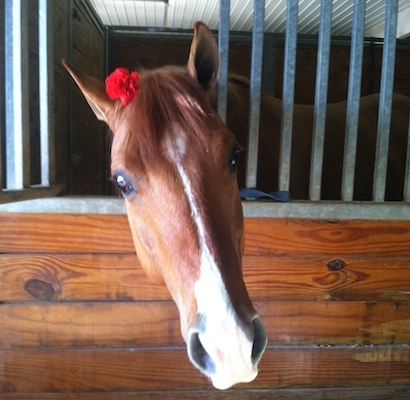 I rode a mare that had a hormone imbalance. She would go along just fine and then something would trigger her in her head and the brain would fly right out and she would go backward. I had no control and no amount of forward cues would get through to her, I just had to ride it out until her brain came back. When it did, she would step off and keep going like nothing happened. You said that you started her when she was two and the change happened between her two and three year old years. That is usually when they become mature and maybe she has something going on there. A lot of the ‘problems’ I have with my own horses, is that I just don’t get to spend enough time with them. As soon as the weather breaks, I’m swamped with client horses and mine are gone to pasture. I get them going good for about 2 weeks, in the spring then have to turn them back out for 6 or so. This one mare I mentioned had a headshy problem when I bought her as a yearling also. It took a lot of work to finally get her to let me handle her head/ears at all times. Even now, with some weeks off I have to insist again I can handle her ears– she will though. She’s super smart and athletic, picks up correct leads, spins, cues off my legs for everything, can do amazing slide stops– but I’m not sure what that first 10 minutes of “omg” is all about in her! I get on and expect her to go, I don’t over think it at all, or anticipate it. In fact, I don’t expect it because she is always so calm on the ground and when I’m mounting, I forget! Yes I understand we may treat our own horses different, but I don’t think I do. But I would like to think by 4 summers, I could expect her to realize by now what riding is all about! I am an ‘ordinary horse’ horse trainer, my clients don’t tend to show their horses, though some do, or go on to barrel/roping training, so I get a lot of, well, spoiled and bad horses that people think can be fixed in 2 weeks. I KNOW how to fix horses with diligence and patience a lots of horsey psychology thinking. I’m good at it. My girl is just an immature minded girl, even at 4, and easily reverts to her headshy thinking, so I have to do lots of desensatizing with her, redo lots of easy lessons, and all the things that make a horse believe in itself. I’m not ‘worried’ about her and I remind myself of other horses I’ve ‘fixed,’ and also remind myself that if someone was PAYING me to work her, she’d have been ‘fixed’ long ago, I’m sure, haha! I would love to see another trainer ride her though, just to see what things they might do differently, or not. Just seeing her ride with 80 horses last weekend in a place she’d never been before with out one incident told me she IS sensible– I know she’ll come around some day, and that’ll be a hallalujah moment! My Arab is a slow thinker. I take every lesson and break it down even further and apparently now I know I need to work him everyday. On Tuesday we worked on tarps, he finished the lesson quiet and going over the tarp. Wednesday was off and Thursday he had apparently forgotten everything, including how to go to the right. He’d cross the tarp with it on his near side and the fence to his off side, but not with the tarp on his off side. I had to spend a lot of time going back to basics like simple change of direction and going forward. He finally figured out he could squeeze by with the tarp on his off side without dying. Today he was still sticky to the right but much better and quieter. Guess no more days off for him!